Get back to the days of old Vegas and classic slot machines in this fantastic 3 reel game. Click here to play! Spin the reels and you might just find yourself cashing in a pretty substantial amount of money! As is the case with Las Vegas, it’s all about the cash! This classic slot game will have you spinning in combinations of money symbols. These golden signs hold the highest payout if you can spin three of them across one of the five paylines. In fact, line one pays out 1000 coins, line 2 gets 1500 coins, line 3 gets 2000 coins, line 4 gets 2500 coins, and line 5 will payout a massive 5000 coins. In addition, these money symbols are a wild, meaning that they will replace all others to help you spin in even more wins! 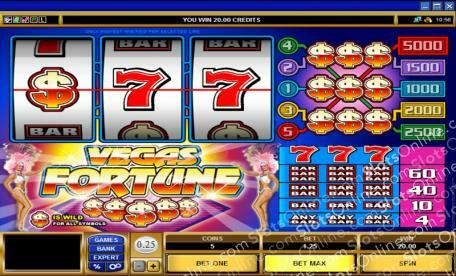 There are also lucky sevens and single, double, and triple BARS to help you amass your Vegas Fortune! Be sure to bet the max of five coins to activate all of the available paylines. Spin the reels on this fantastic game for a full on Vegas experience, and who knows, you might just find yourself hitting the big money! The golden money symbol is a wild symbol. It will substitute for all other symbols to help you bring in more winning combinations.